Look Shadow!!!. Cuteeeeee. Wallpaper and background images in the shadow el erizo club tagged: shadow hedgehog silver chibi. they both look sooooooooo ccccccuuuuuttttteeee!!! !either the way i have crushes on both of them! HOLD ON SEGAFAN WHAT DO YOU MEAN BY theres a heart by silver?????????????????? ?TELL ME CUZ IM A SILVER FANGIRL?????????? AWW silver is sooo cute! Awww how cute! Silver thinks that he can be hot like shadow!!! Me: silv, u know u won't be hot like Shad no matter how hard u try! Silv: WHAAAH! Shad: y the h*** is my lil bro crying? Me:*blushes* Shad: good move Hun. We both kiss happily. Silv: EEEWWW!!!!!! awww! silver looks soooo CUTE in this pic! 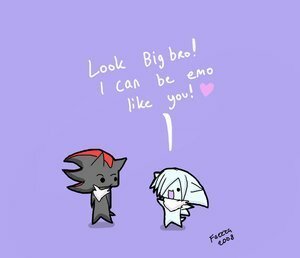 Emo Silver... I can't decide if that's a dream come true or a horrific nightmare.